Now, I just want to say from the outset that my hair care routine is by no means perfect - but my hair seems to grow really quick and everyone always asks me what my secret is, so I thought I'd put together a little post about the products and routine I use to keep my locks healthy. Ps this post is really wordy, sorreh. I actually am naturally blonde, but over the years I experimented with different colours and now I have to bleach it in order to keep it blonde; this means my hair isn't in the best condition, so I use a lot of products to counteract that. I don't bleach my hair super often, mainly through laziness - I do it every 2 months or so, or when I can't stand looking at my roots any longer! I use the Live XXL in Ice Blonde, and follow it straight after with purple shampoo from Pro:Voke, which I reviewed here. I use this in place of a toner to get rid of the yellow & orange tones. I also use the Pro:Voke as an actual shampoo, although not every time I was my hair - which I do every few days. I've also been using the L'Oreal Fibrology shampoo as my regular every-time shampoo, which I find amazing as you only need a tiiiiiny bit and it lathers up like nothing else in the world. I don't know if it is actually making my hair thicker, but my hair does seem a lot healthier since I've started using it! I use conditioner every time I wash my hair - I never really stick to the same one, I just buy whatever is on offer. I'm a fan of the Alberto Balsam ones though, particularly the raspberry scent. I've also been using the Hello Hydration range from Herbal Essences (the blue one) which I love because it smells like summer in a bottle. After washing my hair I always blast it with cold water as this closes the hair follicles and stops it getting greasy too quickly. Like I said I'm ridiculously lazy, so a lot of the time after washing my hair I just chuck it up in one of those turban-towels and let it dry without even combing or brushing it. On the odd occasion when I'm washing it before a night out, I pop a bit of argan oil in it, brush it through and then blast it with a hair dryer. I always use heat protect spray before any type of heat too! I never ever brush my hair when it's dry because it just turns into a massive fluffy ball of static - BUT for Christmas I received my first ever Tangle Teezer, and I'm in luuuuuv. Not only is it much easier to get the knots out, but it doesn't turn my dry hair into a frizzy mess. I'm so glad I finally have one in my life. I'm also a massive fan of hair masks, and I've blogged about loads before, including making my own - which can sometimes be fun and sometimes be gross. I wrote a post about it ages ago if you fancy checking it out. One time I also slept with normal conditioner on my hair and washed it off the next morning: total bliss. So there you have my hair care routine; I don't think I do anything particularly revolutionary, but my hair does grow super quick so I thought I'd share what I do and what I use in case any of you want to know! I'm also considering getting my hair chopped off (to my shoulders) what do you reckon?! I've popped some photos in this post. My hair growth in the space of 3 months. Sorry for the lack of product pictures in this post - I'm at my family home rather than my university house, and I forgot to bring most of my regular products home with me! You have mermaid hair! I'm sure it would look gorgeous cut shorter but I have such fine hair that I'm always so jealous of girls who can have beautiful thick wavy hair! I never use conditioner as my hair doesn't normally need but if I've been experimenting with the dyes (which I have to admit happens every so often) I have to head back to them. I used a £1 one from Morrisons and it was one of the nicest I've ever used! Kind of jealous of your hair length! Mine never seems to grow! 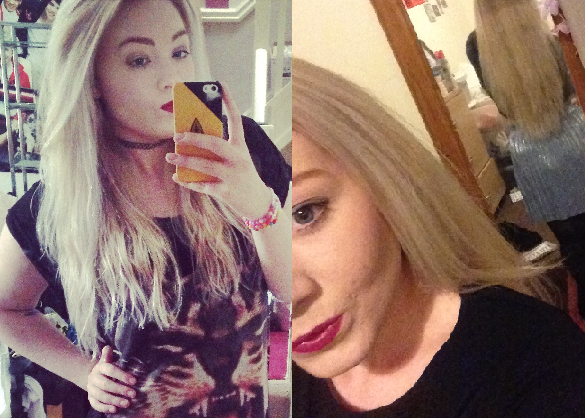 You should definitely go silver! My hair is strawberry blonde at the moment but it's naturally quite dark red. I really want to go silver-grey but I've been told I'll look like an OAP or a lunatic! Haha.